The primary fund raiser for the Snohomish County Master Gardener Foundation is our annual plant sale. This year, the sale will be held on Saturday, May 7, 2016 from 9am - 2pm at McCollum Park. Each year, our plant sale features an extensive selection of perennials, shrubs, trees, berries, and grasses. In addition, our sale is famous for an amazing selection of tomato varieties - old favorites, new varieties, heritage plants and more. This year, we will have 8000 tomato, herb and vegetable starts to help you get a jump on your kitchen garden, including basil, cucumbers, squash, peppers and lettuce. Treat yourself and your garden friends to a day of garden delights at the lovely Lynnwood Convention Center. Enjoy our free garden seminars with renowned speakers. Free entry to shop from over 40 unique, handmade, nature inspired artists and local specialty plant nurseries. Unload plants, set up tables, price plants, set up displays, cashier—there are dozens of volunteer jobs to do at the Spring Plant Sale. Many NPA members volunteer so that they can get into the sale early and scope out the choice plants before the hordes of shoppers hit. Everyone has fun and it’s a great way to meet other NPA members. To volunteer, sign up here. Hardy orchids, unusual woodlanders and natives. Unusual, garden-worthy plants from around the world: vines, perennials, shrubs, trees, grasses and container plants. In 1984, Barbara Flynn held the first NPA plant sale in her horse paddock. The sale migrated from there to the driveways and garages of members’ homes. Attendees brought plant donations and their lunches, shopping for a few hours and then enjoying the companionship of fellow plant lovers. As the size of the sale grew, it moved in 1988 to a schoolyard in North Seattle—a friendly site, except when it rained. 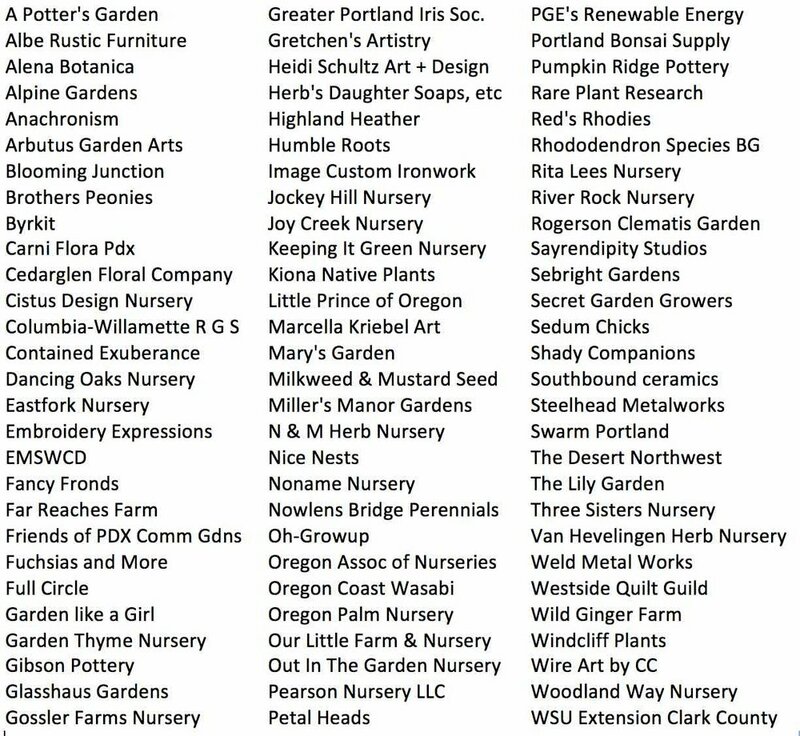 Along with the member-donated plants, there was choice stock from the NPA Border at the Bellevue Botanical Garden and from local vendors. With continued growth, the sale moved to Magnuson Park in 2000 to gain more space and a covered area, first using the old fire station for several years, then moving to a maintenance building. In 2007, the sale was held in a hangar so large, it could hold all of our members shopping at the same time—but it was freezing cold and the restrooms were terrible! In 2008 we moved the sale to the comfort and convenience of North Seattle College, where it continues to be held today in the cafeteria and surrounding area. The dates for the Heronswood’s 2016 Plant Sale & Garden Opens have been announced! The 2016 season will begin with an Early Spring sale. This event was introduced last year to great enthusiasm from visitors eager to shake off the winter doldrums and get back into the garden. 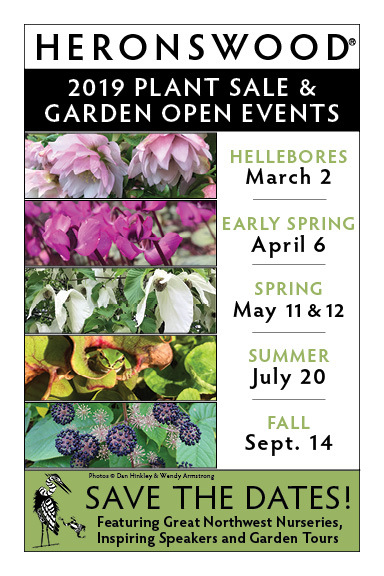 In addition to the opportunity to explore Heronswood, each Plant Sale & Garden Open throughout 2016 will feature a host of plant and nursery vendors from around the Pacific Northwest. Also featured will be our always popular free lectures, a food court, and more! We’ll update this page as we confirm vendors, lecturers, and other details. Stay tuned! Announcing: Heronswood Fall Plant Sale & Garden Open! Join us for our 16th annual "Frolic" Open House! 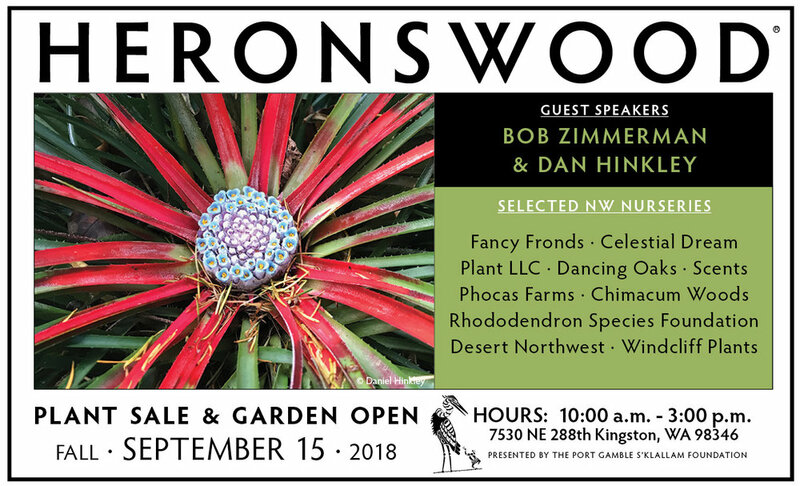 With over a dozen specialty art and plant vendors from all over the northwest, you are sure to find irresistible plants and decor to enhance your garden. Enjoy our scenic setting along the Skykomish river in the height of summer while browsing rare plants and hand crafted art. Saturday, April 25, 9 a.m. to 5 p.m.
Sunday, April 26, 10 a.m. to 2 p.m.
Friday, April 24, 5:00 to 7:30 p.m.
FlorAbundance will return in April 2015 to Building 30 at Magnuson Park. Please join us for the region’s largest and best plant sale, and help support the Foundation’s mission. As always, dozens of specialty nurseries will be on hand selling a wonderful selection of locally grown trees, shrubs, perennials, annuals, and edibles. NPA's biggest sale of the year features thousands of plants from specialty nurseries, our famous NPA Border and members’ gardens. Shop in comfort indoors. Discover new plant introductions, the rare and unusual, as well as established favorites. Perennials, natives, woodland plants, grasses, shrubs, small trees and much, much more. Shop tax-free while you help support the educational programs of NPA. Plenty of free parking. For quick plant sale access, park in the lots on the west side of campus, off College Way North, between 95th & 97th. Parking is free in these lots on Sunday.Get driving directions. Join us for one of the biggest annual plant sales in the Northwest, with vendors from California to Canada! Held at the Portland Expo Center on Saturday, April 18th and Sunday, April 19th from 10 am to 3 pm. Admission is free and there are oodles of unusual plants, books and art to browse.